TAKEMOTO OIL ＆ FAT Co., Ltd. Is dedicated to developing new technology in edible cooking oil (sesame oil) and a broad range of specialty chemicals. From aerospace to food packaging, plastics have an impact in our daily lives. Plastic is the main component in many tools and products we use throughout our life. - Physical properties begin to decline even after only a few days. 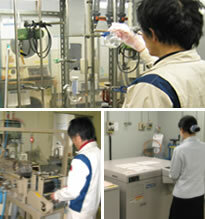 We offer solutions to help you overcome the problems and weaknesses of plastic. With a lot of lab-size machinery and analysis equipment, we can support a variety of our customer's needs, from the fundamental development stage through commercial application. Because of our extensive knowledge and capability, we can assist in the development of test standards and develop new, innovative technologies in partnership with our customers. We are confident that we can properly support our customers with regular communication, value-added solutions development and our technological driven philosophy. This product offers controlled migration of the active ingredients. With the proper level of loading onto the surface layer of multi-layered film, it provides good anti-static effect for a long period of time. Test Example:ELECUTMASTER L-250 for 3-layer PE films. This product has good heat stability and anti-static effect while maintaining good transparency. Test example:ELECUT S-418 for PC injection molding. This product provides higher crystallinity for PLA resin at lower loading amounts compared with a typical talc. 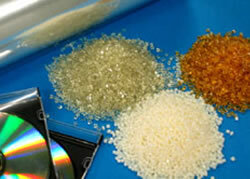 UV absorber for PET and PC resins. This product has good heat stability and good durability to weather exposure tests at low loading amounts. Anti-static coating agent for a variety of general purpose resins. It provides good long-term anti-fogging performance with lower friction and good releasing effect. Anti-static agent for PS films. This product has food contact approval in Japan(JHOSPA). It offers good durability for stretching processes and ink-printing with no back-transfer of ink. ELECUT C-011 4x109ohm/sq. 2x1010ohm/sq. >1014ohm/sq. Anti-static agent for PET resin. This product has very good heat stability (> 250degC). It offers good durability for stretching processes and good Anti-static effect even under low humidity conditions. Releasing agent for PET film. These product are water base coating. By mixing the products at the right ratio, provide good strength to the coated skin layer and a very low level of undesired transferring to the counter adhesive surface. Adhesive binder for PET film. This product provides a good durability of Al-metallization and good cohesion with UV-ink.